When injured due to a criminal event in The Roads, you are encouraged to call The Roads crime victim lawyers at the Wolfson Law Firm. The first few steps you make can be crucial to your damages recovery success. It isn’t easy but it’s not impossible to be compensated as an injured crime victim. You can call us at 305-285-1115 for your free consultation. You can also visit our personal injury office located in The Roads at 3399 SW Third Avenue in Miami. The Roads is simply a name of a Miami neighborhood. 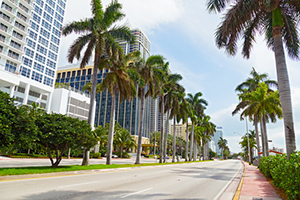 It’s not as popular as neighboring Brickell and Coconut Grove, so it often confuses out-of-towners with its unusual name. The Roads is off the normal Miami street grid, so all the streets in the area are called roads, not streets and avenues like in the rest of Miami. The Roads abounds with old homes, tree-covered streets, some historic public schools, and religious centers. The neighborhood is small, with only 7,300 residents who live there. There are other types of criminal accidents that could happened to you in The Roads, and if that is the case, you may be entitled to claim damages recovery. This list is not exhaustive. It consists just the most common crimes occurring in Miami according to the experience of our Miami personal injury lawyers. Crime victims who have been injured in The Roads criminal events may be eligible to compensation from the criminal offender, third persons, or from the Florida Bureau of Victim Compensation. On paper, recovering from the offender should be easy once he is proven guilty and convicted in court. In reality, they almost never pay for damages. They either don’t get caught by the police or don’t have the money to pay for all your injury-related harms and losses. That’s why you should consider the other two options. If the crime has occurred at a commercial location, the person or corporation that controls these premises may be liable under Florida premises liability laws. Commercial enterprises such as amusement parks, affordable housing buildings, convenience stores, and shopping centers owe visitors a duty of care, which means taking all the reasonably necessary measures to anticipate foreseeable crimes. When negligent security causes a breach of this duty, and that leads to crimes and injuries, they may be legally responsible to pay for the damages caused by their negligence. The third option leads to the Florida Bureau of Victim Compensation. All they want you to do is support your claims with clear-cut evidence that you’ve been injured in a criminal accident in Florida. That would be enough to get you compensated for some, but not all, of your economic losses. It is not as simple as it sounds, though. Crime victims and murder survivors in Florida always face obstacles on the road to damages recovery. Having crime victim compensation lawyer on your side can make the difference. The lawyers at the Wolfson Law Firm offer you free consultations by calling us at 305-285-1115. We never ask for fees unless and until we recover for you.